Topdon may not be the oldest manufacturer of OBD scan tools, but it’s definitely giving other brands a run for their money. The company has an exciting line of auto diagnostic products. Most noteworthy, they all feature high-end functionality in a simple and affordable device. In this review, we have picked five of the best Topdon OBD2 scan tools. Each one is probably worth your consideration if you are shopping around for a scanner. The Topdon Elite ABS/SRS OBD2 Scanner is an amazing tool for DIY car owners. Affordable as it is, it will help you check the engine system and turn off the Check Engine Light. The Topdon Elite ABS/SRS OBD2 Scanner supports full OBD2 functions and is compatible with four main protocols. It also reads and clears all OBD2 DTCs. That sounds rather technical, so let’s put it in simpler terms. 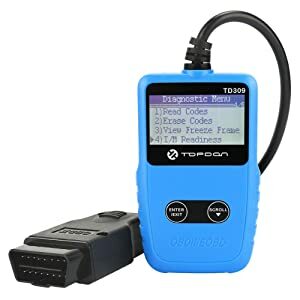 This Topdon OBD2 scan tool will diagnose your car and tell you what’s bringing the Check Engine Light on. Instead of getting the diagnosis from the shop, you can do that yourself. By the time you get professional help from a mechanic, you’ll have known what the problem is. Even better, the scanner provides definitions for DTCs and suggests repairs for all detected problems. So basically you will be going to a mechanic’s shop with background knowledge of how the problem should be fixed. Additionally, the Elite ABS/SRS OBD2 Scanner tests I/M monitor readiness and reads ABS and SRS codes. I/M readiness tests show whether the car’s computer system is ready to diagnose the emission system. On its part, the anti-lock braking system (ABS) test determines whether the wheels are well configured not to lock up (cease rotation) and cause skidding. Finally, the supplemental restraint system (SRS) test checks whether the car’s airbag functions normally. It’s critical to the overall safety of the vehicle. 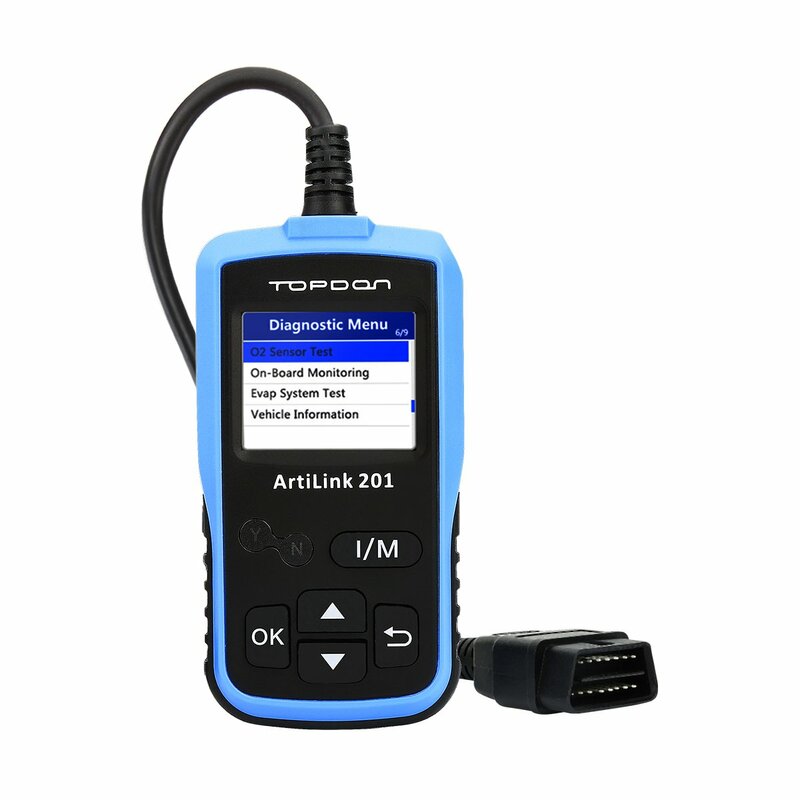 In short, the Topdon Elite ABS/SRS OBD2 Scanner will allow you to diagnose MIL, ABS, and SRS. For the MIL, the scanner covers all common vehicle models that have OBD2 systems (cars made in 1996 or later). As for ABS and SRS, it works on OBD2 cars made from 2001 and onwards. Compact design; measures 9.8 x 5.4 x 3.2 inches and weighs 1.5 pounds. The screen could have glare when there’s sunlight. The Topdon Elite ABS/SRS OBD2 Scanner is an amazing tool for DIY car owners. Affordable as it is, it will help you check the engine system and turn off the Check Engine Light. Moreover, you can also use it to get ABS and SRS fault codes. What that means is that you can actually use this scan tool to diagnose your car yourself. If you are a DIY type of car owner, it will help you save some time and money that you would have spent at the shop. The user-friendly design of the TD300 makes it very simple to use. It is fitted with a backlit LCD screen where you can view all diagnostic data and help topics. The whole interface is easy to navigate and features English menus. A small-sized, entry-level scan tool, the Topdon TD300 OBD2 Code Reader is ideal for beginners and average car owners. With it, you can read and clear all fault codes related to the Check Engine Light (MIL). It covers OBD2 and CAN compatible vehicles. More specifically, it works on US-made vehicles (manufactured in 1996 or later) as well as EU and Asian-made vehicles (manufactured in 2000 or later). This Topdon OBD2 scan tool has a built-in library that contains definitions of codes. Therefore, it is very simple to use, even to an ordinary car owner with no professional mechanical knowledge. So every time the Check Engine Light comes on, simply plug it in the OBD2 port and it will retrieve MIL codes. You can then use the library to understand what each code means. That way you will know every fault in your car even before you take it for repair. The Check Engine Light will automatically turn off once each fault is fixed. Other than reading MIL codes, the Topdon TD300 also runs the I/M readiness test for emission systems. It also retrieves vehicle information (VIN), which will help you know a car’s history. That’s very important when you are dealing with a new vehicle. With dimensions of 4.8 x 2.6 x 0.8 inches, this scan tool is well-sized for portability. Plus it weighs just 9.1 ounces, which is light enough to store in a toolbox or car’s compartment. The package includes a 3.6-ft. long cable for connecting the device to your car’s OBD2 port. Easy to use even for someone with no professional knowledge. Wide vehicle coverage. Works on 1996 US-based and 2000 EU & Asian-based cars. Has an intuitive user interface. Contains built-in library with several help topics. Only does basic diagnoses related to Check Engine Light. Doesn’t check systems like SRS and ABS. This Topdon OBD2 scan tool is perfect for beginners. If you are just getting the hang of car diagnostics you may want to consider adding it to your toolbox. It offers the basic diagnosis functions that turn the Check Engine Light off. Equally importantly, it is easy to use and doesn’t require you to know anything about car mechanics. Also, it is very affordable. The Topdon TD309 OBD2 Code Reader is built for average car owners who prefer to troubleshoot car problems at home. If you are one of those whose first instinct is to diagnose the car before driving to the auto shop then you should get this scan tool. 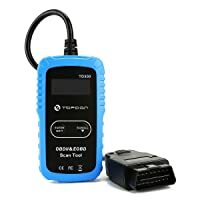 If you are looking for a compact, affordable and easy-to-use scan tool then you should consider the Topdon TD309 OBD2 Code Reader. It may pass as a basic OBD2 scanner but it brings so many benefits to the table. For starters, it has a wide vehicle coverage. It works on OBD vehicle made in the USA from 1996 onwards and those made in the EU from 2000. That includes 12V trucks. With regards to functionality, this Topdon OBD2 scan tool reads DTCs that relate to the MIL. That means you can use it to find problems that usually trigger the Check Engine Light. It will retrieve the codes and provide you with definitions for each. If you have it you can know how to fix the problem yourself without necessarily taking the car to auto service. Apart from MIL diagnosis, the device also checks I/M readiness and retrieves freeze frame data. I/M readiness shows whether the car’s computer system can run emission tests. On the other hand, freeze frame data helps to isolate causes of emission-related problems. In addition to that, the Topdon TD309 also retrieves vehicle information (VIN). Therefore, if you are presented with a new car you can use the VIN to check its history, including the parts that have been replaced before. Impressive as it is in functionality, this scan tool is not disappointing in design. It features a color LCD display for easy navigation. Overall, it weighs just 8.8 ounces and measures 4.3 x 2.6 x 0.7 inches. The small and compact size makes it convenient to carry. Plug and play device, you don’t need to do any installations. Covers a wide variety of OBD2 vehicle models. Supports English, French, German and Dutch. Fast at reading and clearing codes. A functional scope is limited to MIL, I/M monitor readiness and vehicle information. It doesn’t cover other systems like transmission, ABS and SRS. 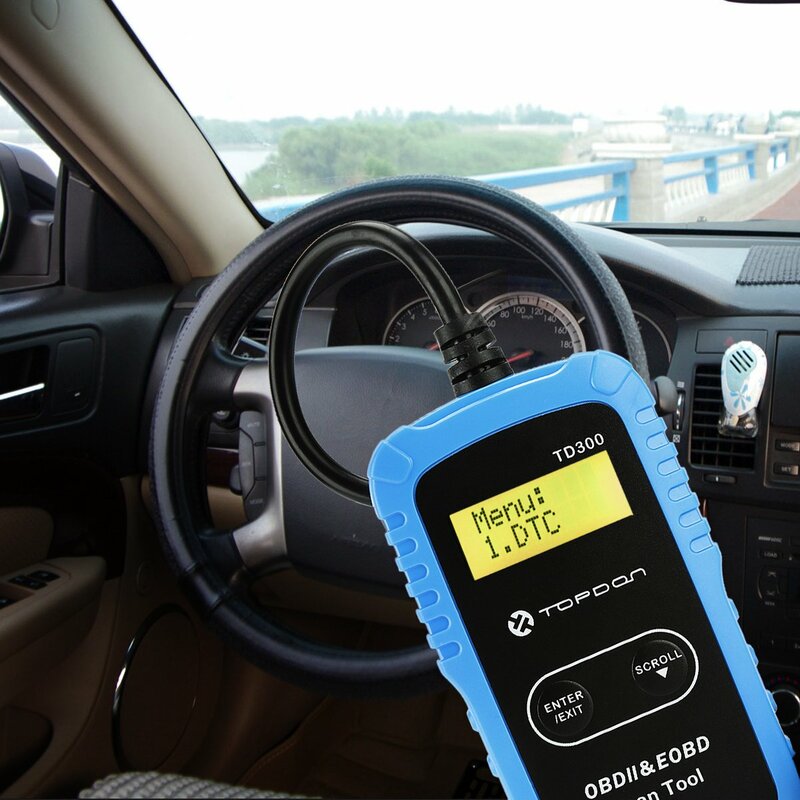 The Topdon TD309 OBD2 Code Reader is built for average car owners who prefer to troubleshoot car problems at home. If you are one of those whose first instinct is to diagnose the car before driving to the auto shop then you should get this scan tool. It will help you pinpoint problems that usually turn the Check Engine Light on. With its rich library, you may even be able to solve some of those problems yourself. The Topdon Professional Plus 2.0 is an excellent scan tool for reading a car’s fault codes. It helps to turn the Check Engine Light off. You may want to add it to your shopping list if you want to avoid those regular visits to the auto mechanic. Basically what a Topdon Professional Plus 2.0 does is run a diagnostic test for your car. It will present you with the test results, showing every fault in the car. You can then use that information to fix those problems. Quite a nice way of saving time and money, isn’t it? But what exactly does it diagnose? Well, this Topdon OBD2 scan tool reads and clears OBD2 engine DTCs. Those are problems codes that usually trigger the Check Engine Light. Most relevant, it also runs the I/M readiness, O2 sensor, and on-board monitor tests. The I/M test checks whether your car can pass emission tests. The O2 sensor test will tell you whether your car’s emissions and fuel usage and efficiency. Finally, the on-board monitor test checks to see whether every emission-related system works as it should. Beyond that, it also provides freeze frame data and VIN (vehicle information). Most noteworthy, every test/scan result is displayed as real-time, live data on the device’s LCD screen. One of the best things about this scan tool is that it has a lookup library with definitions and repair suggestions for each problem code. So basically what it does is give you the chance to do minor maintenance and repair works yourself. Rugged but compact design. Measures 9.8 x 5.1 x 3.2 inches. Lightweight (1.1 pounds) for portability and easy storage. User-friendly interface with menus in English, French, Spanish, Russian, German, Italian, Chinese and Japanese. Uses the car’s power and doesn’t require a battery or charging to work. Provides live data very quickly to save diagnosis time. Comes with free lifetime updates. Not ideal for beginners. Compared to other Topdon scan tools, Professional Plus 2.0 may be a bit hard to navigate for a beginner. That is because it has fairly more functions and menus. 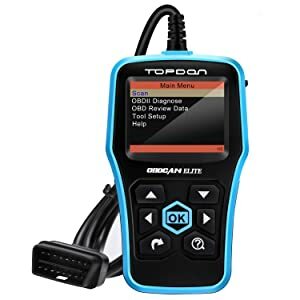 The many functions (including coverage of OBD2 protocols, MIL diagnosis and tests like I/M readiness, O2, and on-board monitor tests) make this scan tool a good possession for DIY people and car enthusiasts. If you have it you can diagnose a variety of problems. For example, the help it offers by interpreting codes and suggesting repairs means you can fix some of those problems yourself. That should help you save not only some good time but also money. This Topdon OBD2 scan tool is meant for beginner to intermediate car owners. 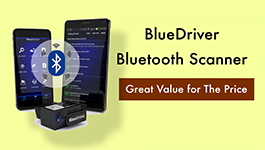 If you are new or know just a little about car diagnostics then it is suitable for you. The Topdon AL201 OBD2 Code Reader is yet another affordable scan tool from Topdon. Despite its low cost, this device packs some very impressive features. It reads and clears codes on OBD2 compatible vehicles (US-made from 1996 and EU-made from 2000). The device supports all OBD2 protocols. More specifically, you can use it to diagnose MIL problems. Those are engine issues that turn the Check Engine Light on. 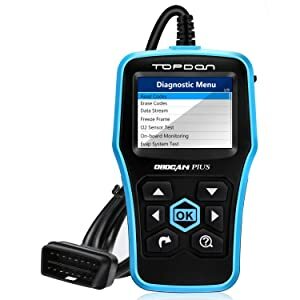 If you have this Topdon OBD2 scan tool, you will be able to pinpoint the exact problem and even turn off the Check Engine Light. Additionally, it supports three primary emission tests. The three are O2 sensor, I/M readiness and on-board monitor tests. With it in your toolbox, you can check your car almost every day to ensure that it passes emission tests. For easy operation, the Topdon AL201 is fitted with an I/M hotkey for quick access to the I/M test. Therefore, you can track everything and view codes/test results through the large LCD screen. It is easy to carry too. With a weight of 12.8 ounces and dimensions of 4.9 x 2.6 x 0.8 inches, it is one of the most portable Topdon scanners. Besides, in the package is a 3.6-ft. long cable for connecting the scan tool to the OBD2 port of your car. Compact, rugged and portable design. Comes with 12-month warranty and free online updates. Supports several languages, including English, French, Russian, Germany, Italian, Spanish and Portuguese. Has built-in lookup library for definitions. Does not support ABS and SRS diagnoses. This Topdon OBD2 scan tool is meant for beginner and intermediate car owners. If you are new or know just a little about car diagnostics then it is suitable for you. Why so? Many reasons actually. First of all, it is very affordable; which is exactly what a beginner needs. Secondly, it is fast in scanning and running tests. So basically you get the speed of a high-end scan tool in an entry-level scanner. Finally, it offers just enough functions to help you get a grasp of car diagnostics. They include full OBD2 functions and emission tests. In short, it’s not too complicated but it isn’t primitive either. Cons You may have problem with vehicle compatibility. Possible Update issues. Almost none. 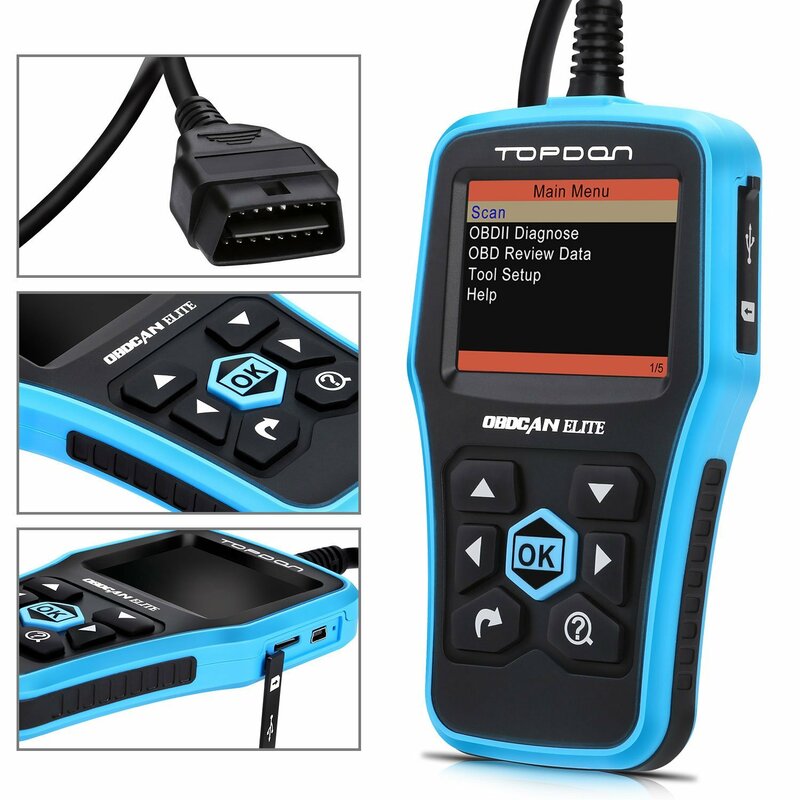 Bottom Line Topdon Elite ABS/SRS OBD2 Scanner is an amazing tool for DIY car owners. Topdon OBDCAN Plus is built for those who want to do simple tests on their own cars. Topdon TD309 is perfect for beginners. Topdon makes some of the most affordable scan tools in the market today. However, the low price doesn’t compromise on their quality though. At the very least, a Topdon scan tool will help you diagnose MIL-related problems. Others like the Topdon Professional Plus 2.0 and Topdon AL201 will even allow you to run emission tests. And if that is not enough you can get the Topdon Elite which also covers SRS and ABS. The point is, it doesn’t matter what you’re looking for in a scanner, Topdon has a model that suits you. Simply check from the five above and pick one. Alternatively, you can go directly to the recommendation section and pick one based on overall goodness, functionality or compatibility.